One of the best shopping days is here! 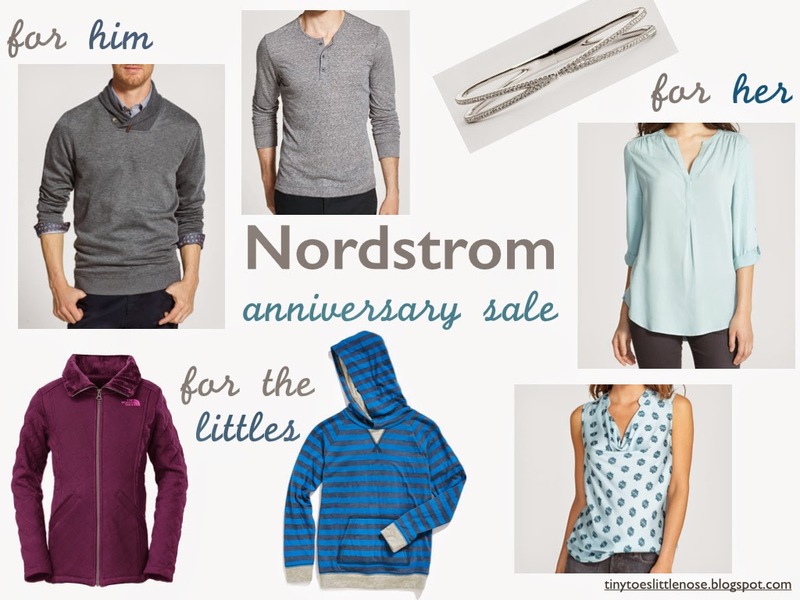 Early access to the Nordstrom Anniversary Sale started today! I was lucky enough to have a fun little shopping date with just my mom to pick out some new goodies for my wardrobe! I don't frequently shop for myself, but I always go big during this sale. Here is a peak at some of the items I picked up for me & the boys. This year I was drawn to mostly grays for Conor & mint for me! It is hard for me to avoid black & gray everything, so I'm happy to be adding a bit of color to my closet. I am obsessed with the bracelet (which I will probably be wearing daily now), and I also had to include the little girls Northface jacket. It is a mini version of the coat I bought last year that everyone always asks about. Any must have items you spotted at the sale?! i have been really good and am trying to stay away from the sale.. but holy moly that tunic is perfect! I want access to this sale so bad!! I think the common folk (read: non Nordstrom card holders) get access on the 18th. I already know a couple of items I will be purchasing! Girl, you have me wanting to go shopping! LOVE all your choices! I've been dying to go to the sale, but just haven't had time. I need to shop online before all the good stuff is gone!